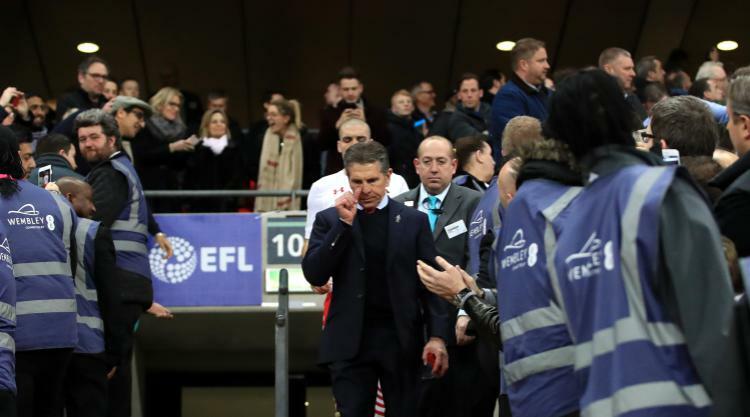 Southampton struggled to relieve the pressure building on manager Claude Puel after an under-strength Manchester United held them to a 0-0 home draw. Saints chairman Ralph Krueger has refused to offer assurances surrounding the Frenchman's future despite him leading them to the brink of an eighth-placed finish and this partly demonstrated why. Puel's future is to be discussed at the end of the Premier League season but with Jose Mourinho again selecting a weakened XI - without Marcus Rashford, Michael Carrick, Paul Pogba, Ander Herrera and David De Gea - the home team had the chance to impress. United goalkeeper Sergio Romero, making only his second league start of the season, instead frustrated them, aiding the Red Devils' preparations for next weekend's Europa League final and demonstrating his ability to perhaps replace De Gea permanently. The hosts were gifted a chance to take the lead in only the fifth minute, when Eric Bailly produced the clumsiest of handballs - albeit outside of the area - to prompt referee Mike Dean to award them a penalty. Manolo Gabbiadini, who posed such a threat to United in the EFL Cup final, took responsibility but was far from convincing as he shot towards the bottom left corner but within Romero's reach, and the goalkeeper tipped wide. Bailly almost instantly responded with a goal of his own, when just three minutes later after beating Nathan Redmond to a loose ball he produced an uncharacteristic run into Southampton's area before forcing a reaction save from Fraser Forster. Wayne Rooney had been selected to start his fifth consecutive league game, this time doing so up front, and despite his decreasing importance to United continues to show hints of the fine player he once was. In the 15th minute he masterfully controlled a high ball before sending Anthony Martial one-on-one with Forster, from where the young forward's shot could do no more than prompt a routine save. Henrikh Mkhitaryan also tested Forster with a low drive from midfield, but thereafter Southampton improved - similarly to at Wembley in February, and perhaps relevantly amid Jose Mourinho's complaints that his United team are tired. It was on the stroke of half-time when, after a poor clearance from Romero, Redmond played a one-two with Steven Davis before shooting low at the goalkeeper. Shortly after the break James Ward-Prowse laid off a free-kick on the edge of the area to Dusan Tadic, from where the midfielder struck well but saw Romero parry clear. They steadily applied more pressure, with Redmond playing in Oriol Romeu whose shot from just inside the area was also saved. Ward-Prowse drew Romero's finest save with a curling effort towards the top right corner as the diving Argentinian impressed in tipping wide. Mourinho introduced Rashford, Carrick and Herrera, pursuing a first league win in five, but the closest they came was in the 71st minute when Martial curled against the right post. Either way they would have remained sixth; perhaps more significant was that sections of Southampton's supporters booed their team off.